If there’s one thing nature loves, it’s symmetry. Sometimes radial symmetry, as we see in starfish or sea anemones; sometimes bilateral symmetry, as in mammals and insects, which have a right half and a left half. External asymmetry is extremely rare in living organisms, and when it does occur, it is generally in a minor form, such as a bird species with beaks bent to the side, or a type of flower with oddly distributed stamens. One of the very few groups with entire bodies that lack symmetry are the gastropods; specifically, the snails. They develop helical shells with asymmetrical bodies to match. The shells also hide how ridiculous they look naked. But this post isn’t about snails. It’s one thing to evolve an unusual asymmetrical bodyplan to go with your asymmetrical home. It’s another to evolve an asymmetrical bodyplan to go with somebody else’s home. 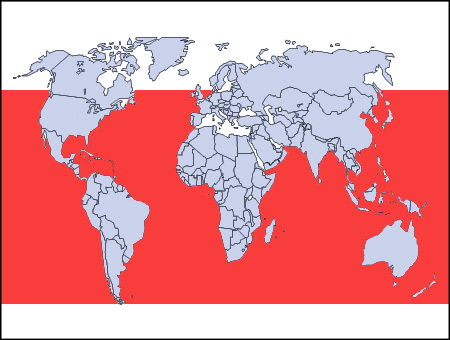 Which brings us to the hermit crab. When snails die in ways that leave behind perfectly good shells on the beach, these guys literally queue up for the chance to move in. 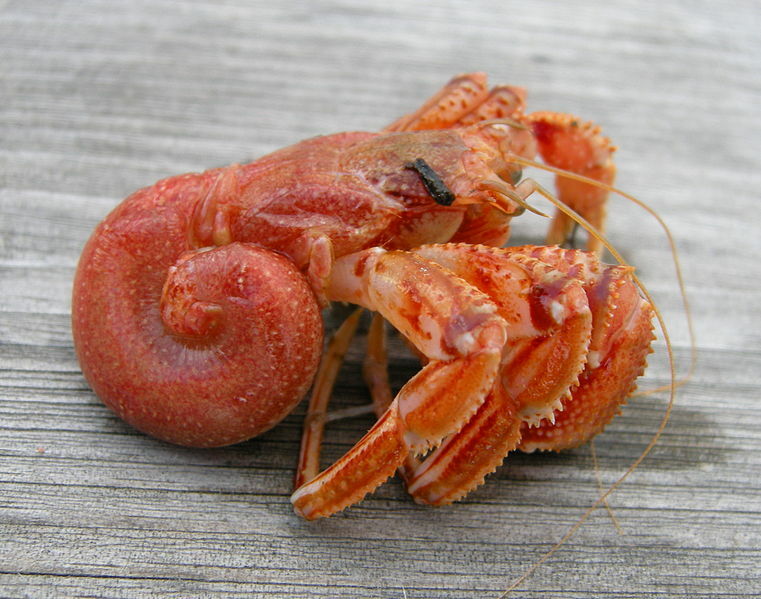 Hermit crabs are part of the decapod order of crustaceans, as crabs are, but are not in fact true crabs, and unlike most other crustaceans, they lack any kind of hard, calcified plating on their abdomens (think shrimp shells). Instead, they have a soft, spirally curved lower body that fits perfectly into a snail shell, with muscles that allow them to clasp onto the interior of the shell. 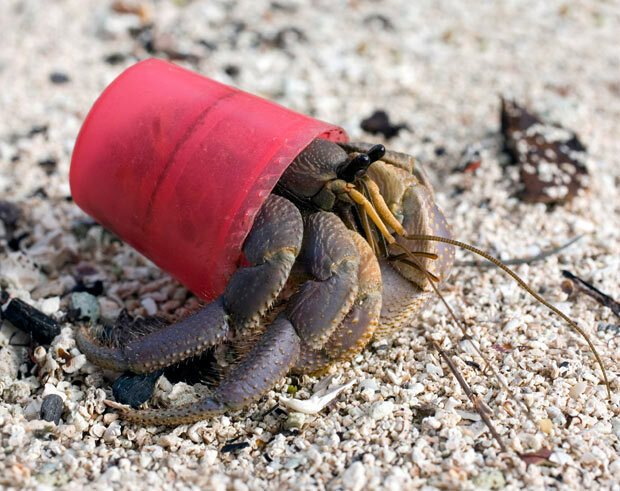 Paleobiologists have found that hermit crabs have been living in found shells for over 150 million years, and that they made the move to snail shells when their original shell-producer, the ammonite, went extinct. 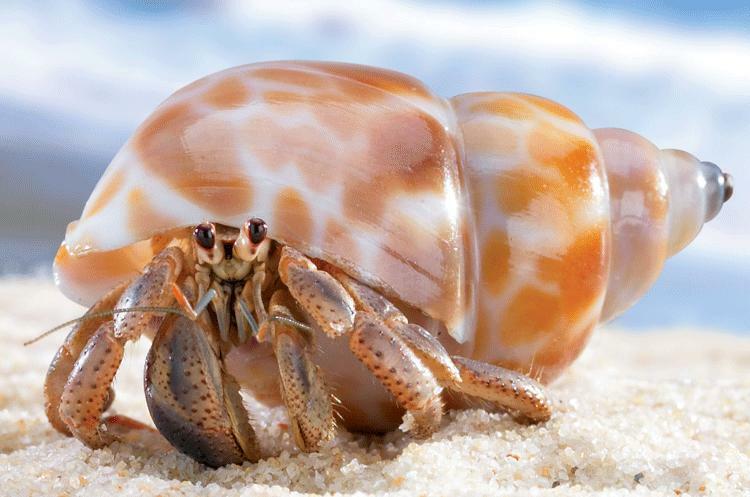 Living in shells has strongly restricted their morphological evolution, meaning the crabs of aeons ago look pretty similar to the crabs of today, because their housing situation doesn’t allow a lot of change. Back to those line-ups I mentioned. Unoccupied snail shells are a limited resource, and an unarmoured crustacean is an easy lunch, so of course a lot of fighting goes on over them; crabs will actually gang up on an individual with a higher quality shell and just yank the poor bugger out. But it actually gets much more complex than that… these little pseudo-crabs aren’t as dim and thuggish as you might think. You see, as a hermit crab grows over the course of its life, it needs a series of progressively larger shells in which to live. 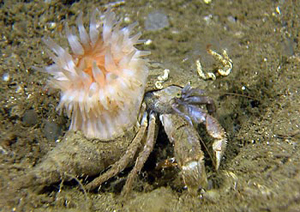 A crab stuck in an undersized shell is stunted in its growth and is much more vulnerable to predation, since it can’t fully withdraw into its armour. The easiest way to find your next home? Locate a slightly larger hermit crab about to trade up and grab its shell afterward. This is how the crabs form what are called “vacancy chains.” A series of individuals will line themselves up in order of size (I’ve seen groups of schoolchildren unable to perform this task), waiting for hours sometimes, and as the largest crab moves to its new shell, each successive crab will enter the newly vacated one. Brilliant… new homes for everybody, and no one gets hurt. In fact, if a given crab chances upon a new shell that it judges to be too large for its current size, it will actually wait next to the shell for a larger crab to come along and a vacancy chain to form. That’s pretty impressive reasoning for a brain smaller than a pea. carcinisation / car·si·nə·ˈzā·shən / n.
a process by which an organism evolves from a non-crablike form into a crablike form. That’s right, glossophiles, thanks to a British zoologist, we actually have a specific word for turning into a crab. English rules.